I made this as I had about 500g of mashed potato, half a tub of ricotta and some double cream (fast approaching its sell-by-date). Not a very colourful dish, but great comfort food! Serves 2. Mix together the mashed potato, flour and ricotta. Turn out onto a floured surface and knead until smooth and thoroughly mixed together. Cut into 3 pieces and roll each into a ‘sausage’ (about 2.5cm in diameter). Cut each sausage into 1cm thick slices (these will flatten out as you cut them as the potato, flour and ricotta dough is very soft), place on a floured tray, and leave in the fridge for at least an hour. Cook by boiling about 5 litres of water in a large pan. Tip the gnocchi into the boiling water (the gnocchi are likely to be a bit sticky, so you may have to ease them off the tray with a knife/spatula). Remove the gnocchi on to 2 plates as they rise to the surface of the boiling water (using a slotted spoon) and keep them warm in a low oven. In a small saucepan, gently heat the gorgonzola and the cream, mixing all the time, until it just begins to boil. Pour over the gnocchi and grind over black pepper to taste. This is quick and easy to make. It goes very well with fresh fruit, and I think it would taste good in an affogato (a scoop of ice cream with a measure of espresso coffee), but I haven’t tried this yet. Above it’s served with a chocolate beetroot muffin. The ingredients below are based on what I had available at the time. I have also made it without the double cream. However, I think that it is improved by the addition of the cream. Using an electric whisk, whip the cream until it is thick. Add the mascarpone, the condensed milk and the vanilla flavouring until it is thick and creamy. Spoon into a plastic container (with lid) and freeze for at least six hours. Use as any other ice cream. Place the dried porcini in a small bowl, and pour on the boiling water. Cover, and leave to stand for 20 minutes. Then drain and squeeze the porcini, reserving the liquid. Chop the porcini. Gently heat the oil in a pan, and cook the shallot for 5 minutes. Stir in the mushrooms and the porcini, and cook (covered) over a medium heat for 5 minutes. Stir in the garlic and thyme, and cook for 1 minute. Increase the heat, add the port, and cook until most of the liquid has evaporated. Leave to cool and stir in the ricotta. Cut the filo pastry sheets in half widthways, and store under a damp cloth. Layer the sheets of pastry into two lots of four, brushing each sheet with olive oil. 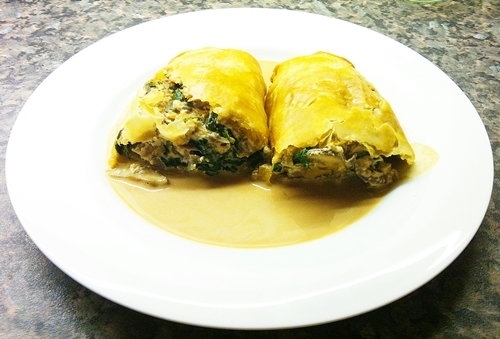 Divide the mushroom mixture in half, and arrange each portion on a pile of pastry. Wrap each portion in the pastry, tucking in the edges, and place on a baking tray, so that the edges are underneath. Brush with oil and sprinkle with parmesan. Cook in the oven at 200C (Gas Mark 6) for about 20 minutes, until golden. Meanwhile boil the liquid from the porcini until it has reduced by 2/3rds. Stir in the cream and brandy, and heat to just below boiling point, and season with black pepper. Serve with the porcini sauce. I made this with butternut squash which had previously been roasted and a red pepper which had been ‘charred’ (see below). 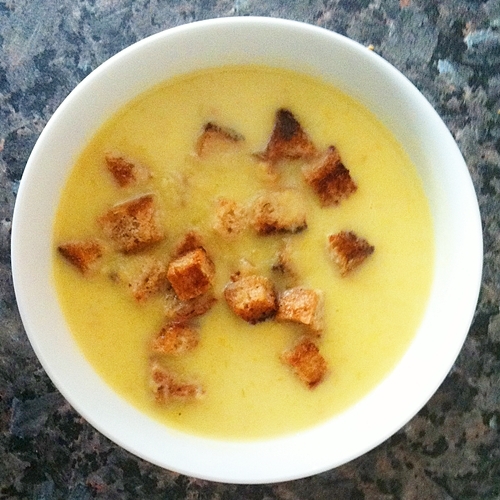 Both processes greatly enhance the flavour of the soup. Char the red pepper by blackening the skin all over using a gas ring (on high) or a blowtorch. Rub off the skin in a bowl of cold water, and slice. Heat the oil in a large saucepan. Add the onion and cook gently for five minutes. Add the garlic and chilli and cook for a further 2 minutes. Add the red pepper, the butternut squash, the passata and the water, and stir in the vegi stock powder. Bring to the boil and simmer (covered) for 20 minutes. Take off the heat and blend (using an electric blender or a liquidiser). Stir in the double cream and heat until just boiling. Heat the oil in a large pan. Add the leek slices and cook gently for 5 minutes. Stir in the potato and carrot slices and cook for a further 3 minutes. Add the boiling water, and stir in the stock powder. Bring to the boil and simmer (covered) for 25 minutes. Remove from the heat, add the cream and blend using a hand blender. Reheat until just boiling. Remove from the heat and season with lemon juice and black pepper to taste. 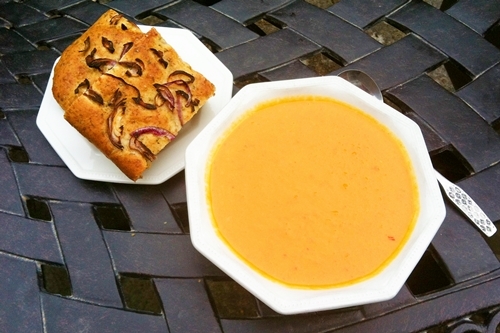 Serve with croutons (see final paragraph sweet potato and red pepper soup). Heat the cream in a saucepan (one which will accommodate the fish), together with the haddock, the pepper corns and the bay leaves. Bring to the boil. Turn off the heat and leave covered. The fish should continue cooking (if not sufficiently cooked gently heat the pan again). In another pan, melt the butter and add the carrots and onion, and gently cook for 5 minutes. Then add the lentils and the stock. Bring to the boil, cover, and simmer for 20 minutes (are until the lentils are just cooked). Stir in the cream (from cooking the fish (having removed the fish, pepper corns and bay leaves)), and continue cooking so that the liquid reduces, until it just covers the lentils. Stir in the parsley and season. 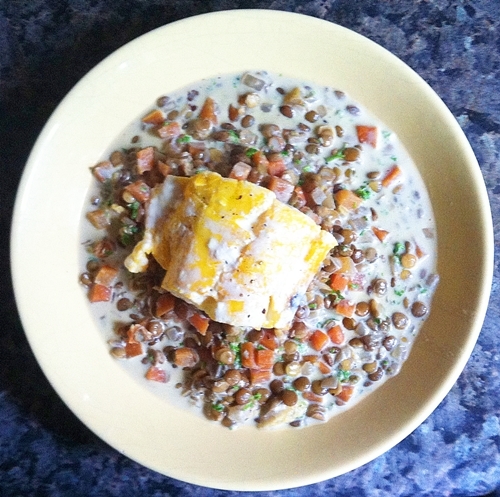 Divide the lentil mixture between two plates and top each with half the haddock.